A friend promises a helping hand – and never follows through. A spouse asks, ‘how was your day?” as they scroll through their Facebook posts. A parent that professes love for a child but continually leaves the child alone in order to pursue their own adult interests. Words, in and of themselves, mean nothing. Talk is cheap. Over the last few weeks I have spent some time thinking about the interactions we have with others – family, friends, co-workers, even strangers. The question that I have been mulling over is, “what are our actions saying?” … not what we are expressing verbally … but … what message are we sending with our words and deeds? Why do people say one thing and do another? Why do they make promises one second only to break them minutes later? Why do people say they care when it’s so obvious by their actions that they don’t? It is easy to say or make promises, it takes effort and time to do things and follow through. 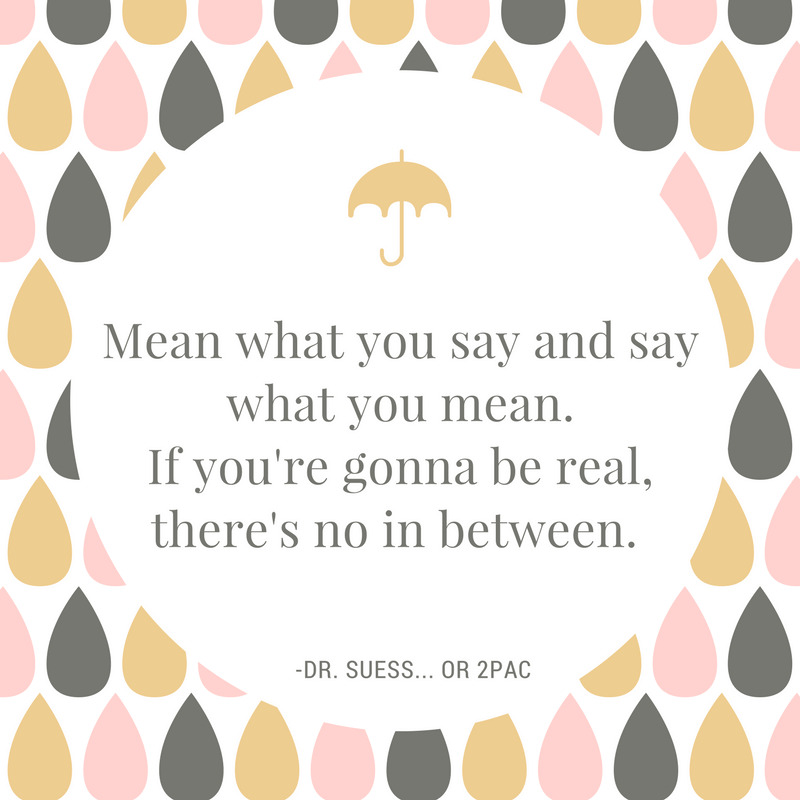 If your words aren’t consistent with your actions, you’re confusing those you’re speaking with and you may be causing irreparable damage to your own credibility. People interact in verbal and non-verbal ways. It is from what is not said, what actions are done (or not done), that judgment is made. I recall a time a friend was invited to travel (cross country) to see a once close relative. Upon arriving my friend found that the home she was to be staying in did not offer a place for her to lay her head. Her relative’s insistence that she come visit, that they would have such fun, was met by the reality that there was no room for her. Nothing had been prepared for her stay. The relative’s words said one thing – her actions said another. Non-verbal communication is powerful, especially in family dynamics, and the repercussions can be lifelong. We all have families that we know that have children that excel in one sport or activity over their siblings. Hopefully the children are all made to feel important, just as special, to their parents. But, when the effort is not made to have time with each child, when one sibling has more parental energy spent taking them to practice, going to games, the parents are showing, through their actions, that one child warrants more attention over the other…this is where seeds of doubt about ability, questions of self-worth, lack of self confidence are planted. No amount of ‘I love you all the same’ matter when you have shown through your actions that no, really, you don’t. You are willing to spend time, energy, and finances on one child over the other…that is a fact…and children readily realize their place in the ‘pecking order’. Partnerships suffer when one person is constantly letting down the other by not keeping their word. If a promise is made for a Friday night dinner and work has, yet again, taken precedence over the prior plans, trust takes a hit. Partners feel let down, disappointed, foolish (for yet again believing that this time would be different). A wedge begins to form. Hurt feelings can be repaired, but repeatedly hurt feelings can cause unrepairable damage. In everyday interaction with people we all have had the experience where we ask for forgiveness – forgiveness is granted – only to be on the receiving end of passive aggressive behavior. When we call the individual out on their actions – remind them that they did, indeed, say they forgave us – but their actions are saying something else entirely. Their words of forgiveness were insincere. Many, many examples can be made of words spoken not corresponding with actions taken. Think of someone you admire. Someone that you would choose to be more like. We emulate people that keep their word through their actions consistently. People are inspired by those who lead by example and actively engage in their own development. Every time you give your word – you put your integrity on the line. You’re saying others can trust you because you value that integrity and would never let them down. Not living up to the words you have spoken tarnishes your creditability, damaging relationships and your reputation. When you operate with integrity, what you say will be taken at face value – your intentions assumed honorable. There is nuance in communication, from the spoken word (tone, tempo) to non-verbal (facial expression, body language) Be aware of what non-verbal cues you may be sending out as well as what message your action (or inaction) is conveying. 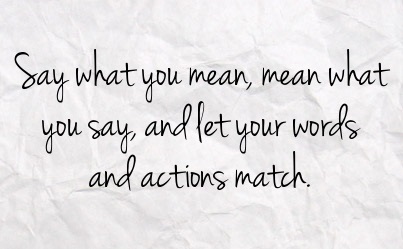 Honor those you are speaking with by making the conscious decision to have your words and action sync. Respect that people take what you are saying at face value and want to believe you – believe in you – don’t let them down. Time decides who you meet in life, your heart decides who you want in your life, it is your behavior that decides who stays in your life…be honorable…conduct yourself with truthfulness, honesty and sincerity…always.